2015 – A quick summary. I say it every year but I really can’t believe how fast this past year has gone. The old saying”time flies when you’re having fun” has a certain truth about it. Although I like to set targets I don’t get all upset if I don’t reach them. I set modest targets so for 2015 I aimed to break my pb tench and do a lot more Zander fishing on the Trent. 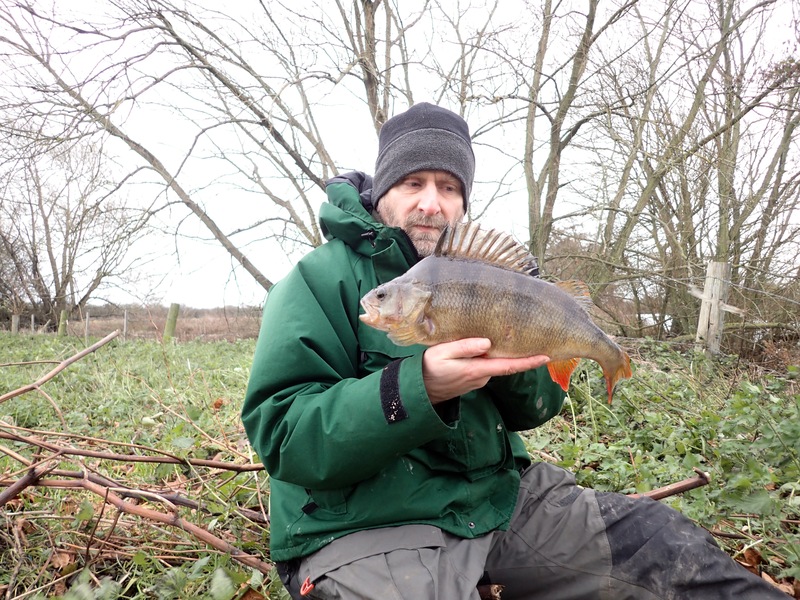 I equalled my pb tench and had a ball fishing for the Trent Zander. I had my first catfish and it came courtesy of the River Trent, something that I didn’t expect or ever anticipate catching anytime soon. 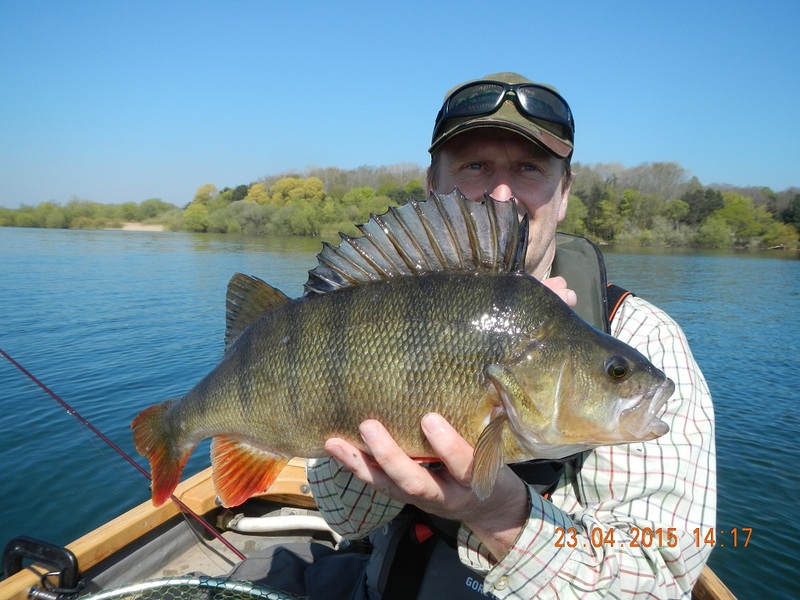 Perch came thick and fast from the rivers in the period from January to the end of the river season in March. I didn’t manage anymore 4’s in that period but more than enough 3’s came my way, along with plenty of 2’s, to keep me happy. It’s fair to say I have a little more time on my hands these days due to work, or should I say lack of it. Unfortunately this doesn’t seem to be translating into more fishing time. I had been keeping an eye on the weather and river conditions though and it looked like storm Frank, or whatever his name is, was on it’s way so I had to make a trip to the river before they became unfishable. I decided on the Trent and on arrival I couldn’t quite make out what state the river was in due it still being dark although after a couple of casts I soon found out as my feeder was swept away in what is normally a very nice steady flow, even when the river is in flood. I waited until it came light and decided to pack up and head to my favourite tributary. After a short drive and a short downstream stroll I arrived at my chosen spot. By now time was cracking on and I put the first rod out just before 10am. From my own personal experience the river fishes best for a couple of hours after first light, after that you might as well just admire the scenery because bites after mid-morning are a rarity. After 30 minutes I wasn’t very confident at all but then I had my first bite on the mother of all lobworms. I struck and the fish came slowly towards me before going off on a powerful run right under the rod tip before the hook pulled from what felt like a decent Perch. I was thinking that was to be my only chance of the day but a short time later the left hand rod pulled slowly round before I struck into another heavy fish. This time there was no mistaking and the fish was safely in the net. It was all head and shoulders and very thin on the backend but I was confident it was over 3 and the scales confirmed it at 3.4. Apart from a couple of plucks later in the day, from what I presumed were small fish, that was to be my only action, not that i’m complaining. It wasn’t a bad note to finish the year on. Saturday saw a few of the Perchfishers meeting up on a south midlands river. The river is only small and is an intimate little place but despite this it has thrown up some very big Perch. Confidence was high and the conditions were perfect. 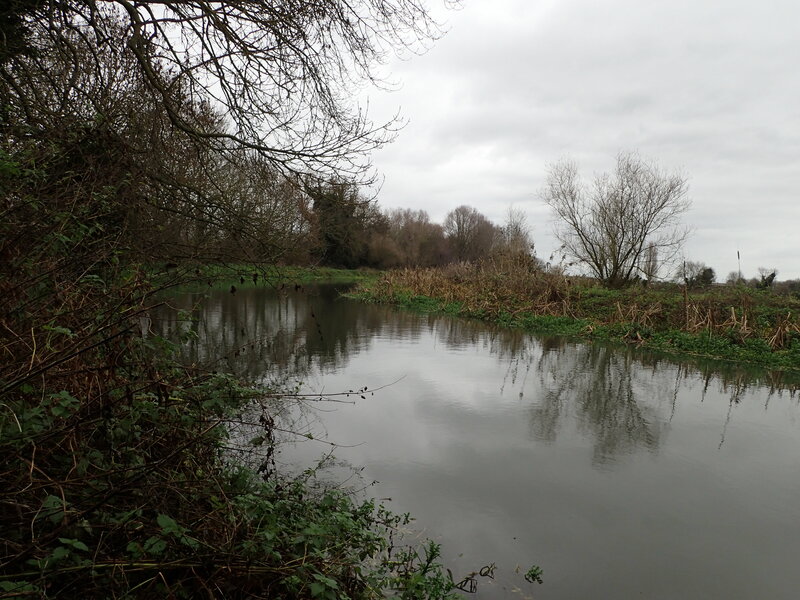 It was overcast and very mild for the time of year and the river although up slightly also looked great. I chose a swim on the outside of a bend with a tree to my left and a weed bed to my right. 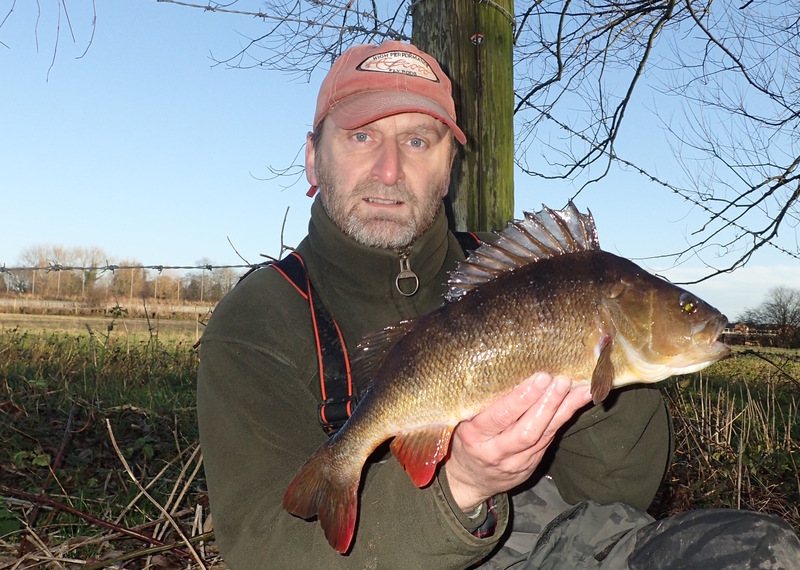 Whilst setting up I had already got visions in my head of a 4lb Perch gracing my net. If it wasn’t me then surely one of my fishing buddies would succeed in catching one. I put a bait downstream towards the tree and another one just to my right close in to the weed beds. I’d got a depth of about 4 foot and very little flow. I’d been looking forward to today’s fishing trip. I wasn’t going to let the gales put me off. I was desperate to get on the river. When the alarm went off though at 5am I was starting to have serious doubts though and for a minute I thought sod it. I kept thinking of all sorts of things to put me off going. The exposed area I was going to fish, the river was higher than I really liked, the 60mph gusts and the fact that I’d caught bugger all of note just recently. To satisfy myself I decided to get up and check the river levels and the weather again. The river had dropped enough to make my mind up and before I knew it I was on the A38 heading south. The original plan was to fish the Dove but I didn’t have a full day so decided to drop onto my local river instead and fish the marmite swim. It’s a bit of a trek but I only managed to take one wrong turn in the dark whilst walking across the fields. When I arrived at the swim it was still pitch black but I know the swim well enough now to put my baits out in the required spots. The swim is directly facing south-west which was the direction the wind was coming from so it was going to be a bit of a blustery session. I set the rods up with the tips as low as I could get them, which is difficult as you are quite high up on the bank, and the rod rest as far forward as possible to stop the rods bouncing about in the wind. At least the air temperature was high for the time of year so I wasn’t going to get blown about and be cold. I’d been looking forward to the next Perchfishers event for several months. It was held on a wonderful looking gravel pit in Kent. Not known for it’s Perch it was to be a bit of a “unknown quantity” which made the prospect even more exciting. As it was a long drive I set off on the Friday and arrived with a bit of daylight left in readiness for fishing on the Saturday and Sunday. The fishery owner kindly showed Mr C and I around the fishery and we settled on comfortable swims that would see us sheltered from the 60mph winds that were due on the Saturday. The rest of the lads showed up early Saturday morning and between us all we fished all over the 40 acre gravel pit. Now I do like gravel pit fishing although I haven’t done any for a long time, mainly because i’m a river man. The water was the clearest i’ve ever seen with the exception of the River Lathkill in Derbyshire. You could see the bottom in 8 feet of water without any problems whatsoever. I fished two open ended feeders a few rod lengths out with a driftbeater float on the third rod a couple of rod lengths out ensuring I setup well back from the waters edge so as not too spook any fish. I know gravel pits can be notoriously fickle made even worse by the turn in weather from mild to very cold overnight but I remained confident even though I wasn’t expecting hundreds of bites.